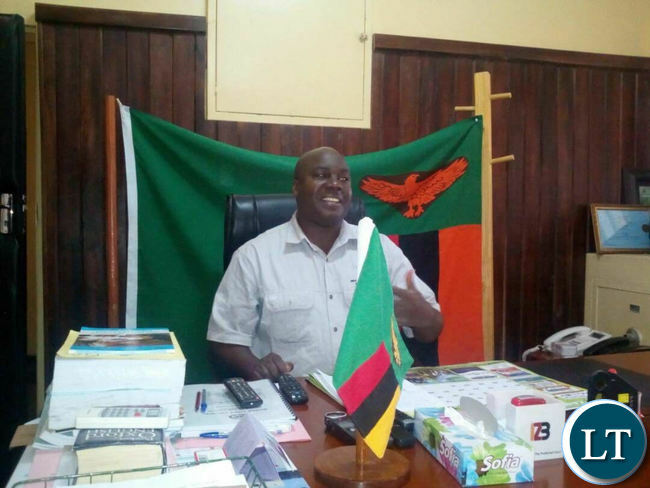 SOUTHERN Province Minister Edify Hamukale has described as greedy and illegal, UPND leader Hakainde Hichilema’s reported acquisition and fencing off a stretch of more than 1, 500 hectares which has been a communal grazing area for animals in Namwala. Dr. Hamukale has charged that there is no way one individual can take up such a huge portion of land without following the law. Under the current land law, only the President can authorise allocation of more than 250 hectares of land. “First of all, communal land should be respected and ancestral land is an inheritance from our fore-fathers. And so, no one individual without following the law can get such a huge chunk of land. I will consult relevant departments and follow up this matter as I don’t have a written report,” he said. taking communal land away from the people, that action borders on greed, inability to feel for the people,” he said. Dr. Hamukale was speaking in an interview at Harry Mwanga Nkumbula International Airport after seeing off the Indian President Ram Kovind, who was in the tourist capital. He said the job of political leaders whether in the opposition or government is to improve the welfare of the people and not to disadvantage them. “Anyone neglecting such a norm is really acting contrary to what society expects. I will verify with the aggrieved community,” he said. Meanwhile, Central Province Permanent Secretary Chanda Kabwe has offered land to families whose land in Namwala has been grabbed by the UPND leader. Mr Kabwe was reacting to an incident where over 600 villages in Namwala have been left without grazing land for their animals after some headmen gave Mr Hichilema over 1, 500 hectares. He said land was available in Central Province and he was ready to assist them settle. Mr Kabwe said the decision by the UPND leader to grab land from the poor and helpless people was a clear indication that he was a person who wanted everything to himself. “As Central Province, we have available land to accommodate those people whose land has been grabbed by the UPND leader. We are telling those people to get out of slavery and come here where we are ready to give them land, grant them freedom and treat them as human beings. He also said the government would not waste time responding to provocative statements from some disgruntled politicians who have engaged in malicious campaigns. Its not greedy but satanic. Team of Socialist Party comrades need rush to go and assess that claim. Mmembe remember your wife Mutinta’s family is from there. There is no way a capitalist can fence off communal landl in Cuba, unless these Namwala people embrace the fencing off HH’s bulls who are too heavy on their cows. It is capitalism, devoid of a human heart. In Lusaka they fence off even roads leading to mayors office. HH should run there and negotiate with people, before the elections. Maybe Tongas are afraid of HH, but not in Luapula, ask Davis Chama, they voted him out!! But he didn’t fence off anything. Ba president HH will be in trouble like Zuma. @Nostra correction my friend its Mwila they voted out not Chama. Mr Hamukala just see to it that small scale farmers in Southern Province are given a fair price for their maize and soya this year, then you can start talking about HH’s huge estate. Charity begins at home I believe the price of maize is a more important issue than the size of HH’s farm even if that may be an issue. Last year it was reported by ZCF that maize in Kalomo was selling as low as K38 a 50kg to the middle men maize buyers and then you have these crooked millers going to process that maize and sell a 25kg as high as K75-K80. No my guy this is wrong! KWALIBO KUTUMPA SANA PA ZAMBIA. IT’S LIKE ANYONE KUTI ANYELA FYE APALI PONSE. HOW DARE THAT ONE PERSON CAN ILLEGALLY JUST START FENCING OFF NOT JUST LAND BUT COMMUNAL LAND? If what HH did is illegal, where is the law enforcement in this country? The Minister also says this is yet to be verified. Why talk about it before verification? This is tantamount to sensationalizing an issue. Sympathy seeker or rubble rouser???!!! This is an example of fake news. We do not know the facts from the other side, in order to make a meaningful assessment. So do not pre-judge. ITS NOT ABOUT HAVING A LOT MONEY..ITS ABOUT BEING GREEDY……THAT DIABOLIC DESIRE TO POSSES ALL TO YOURSELF. GRABBING EVEN THE LITTLE FROM THE POOR PEOPLE. THE POOR THAT YOU DREAM OF LEADING ONE DAY. THE POOR THAT YOU A PROMISING HEAVEN ON EARTH WHEN YOU IN PLOT ONE. THE POOR THAT HAVE SUPPORTED YOU THROUGH THIN AND THICK. LAND AND SPECIFICALLY GRAZING LAND IS THE SOURCE OF LIVELIHOOD FOR THE POOR PEOPLE OF NAMWALA. PERHAPS THIS GREEDINESS IS PATHOLOGICAL..I DONT WANT TO TALK ABOUT WHAT HAPPENED DURING PRIVATISATION. ALL WHO WERE INVOLVED WERE GREEDY !!!!!!!!!! Instead of going to the media to show your foolishness. Use facts from the council that he did infact break the law. Stop being ignorant and silly, who gave you a doctorate? The whole minister commenting about individuals…really laughable!! Stop misusing that name. Have respect of names from other ethnic groups. That alone shows that you are very crude and disrespectful. Why can’t you discuss ideas rather than people? This demonstrates your lack of understanding issues. Intelligent, informed, and reasonable people don’t focus on people, but they discuss ideas. Do you wonder why HH will not have anyone else vai for UPND presidency? It’s greed. Why being selective when PF is known to be selling tracks of land to foreigners. To be honest that amount of hectarage you are talking about is nothing compared to other people (Zambia or foreigner) have in other other parts of Zed. The difference is that HH has developed and protected that land by fencing it and also using it productively by ranching cattle where as other provinces have empty and un-fenced claimed land. IWhat is in your head space if you cannot see between the lines? Under-five mentality. Mine, mine, mine. Me, me, me. I, I, I. So self centered as if even a country is a toy to ring hands around. Hope the people of Zambia don’t hand power to child mentality coz everything would be about private interests. State capture in land, mining, water and natural resource allocation will be huge. The Brenthursts and other UPND financiers will share the country. The Privatisation of State Firms and Housing into “mine” will look like childs’play. Day in day out, people will be displaced off their land. CHIEF MWANACHINGWALA SHOULD HEAR THIS………….!!!!! LOL – Badala ba Hamukale, if it is true you are genuinely educated up to PhD level without leakage, then how come you seem and sound NOT to have the capacity to know and understand how to go about ivoking ‘Rule of Law’ when anybody, and I mean ANYBODY, beaches the law on land occupation? It’s called suing, banene. Why don’t you sue HH? Lets face it, ‘If it walks like a lie, sounds like a lie ……’ that’s why you can’t sue. Simple as that. HH is an evil spirit. Propaganda!!!!!!!!!!!!!! HH is causing tremors! No headman in Zambia especially Namwala where cattle is a positive issue can just give away land! The people in Namwala district know very well the importance of grazing land! I note its PF and its sympathizers peddling this fake news! Whoever is the reporter should have done their homework by interviewing a few key players i.e. the Chief, headman, HH, council and a few more notables before spreading falsities! But why has Hamukale got two remote controls? One is for the air con? One is for the decoder? Why should he be using an air con when poor Zambians are suffering in the heat? Why should he be watching digital satelite TV in his office when he should be busy inspecting projects! Poloka.com at work here! I want us to stop commenting on matters that we have no or less information about..
You are insulting HH before the true and if its not true ????? Let’s always encourage good reasoning nomatter how poor we are. Am sure you agree that poor people have no kind words towards the rich. Stop insulting HH instead learn from him and better pathetic lives. I don’t think the story is true. If its true then he must have acquired the land legally and has supporting documents otherwise Government would have sent police and council to remove the fence. The minister is just playing politics. Under the current law “it’s only the president who can authorize more than 250 hectares of land. …..but you’re right because Hakainde Hichilema is president of Southern Province. Let him grab all the land in SP, after all he is their blue eyed boy. Serves them right.